The Pear Tree is the perfect child size cottage for your child’s large imagination. Complete with the integral 2` veranda and extra high door.With so much space the adventures your child could enjoy is endless and the quality of this cottage ensures the safety of your child while they play. 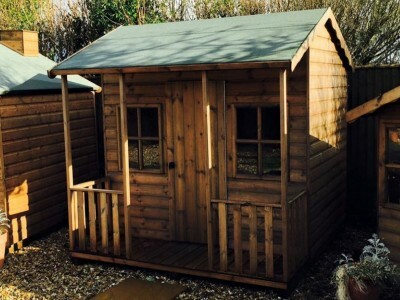 As with all of the timber playhouse range, we only use the best selected softwoods, and rest assured, that there are no OSB or cheap sheet materials used. This will ensure that your Cottage will be standing for years to come.